A Democratic congressional candidate attacked a critic for mansplaining to her on Twitter Sunday, only for the critic to reveal that she is also a woman. 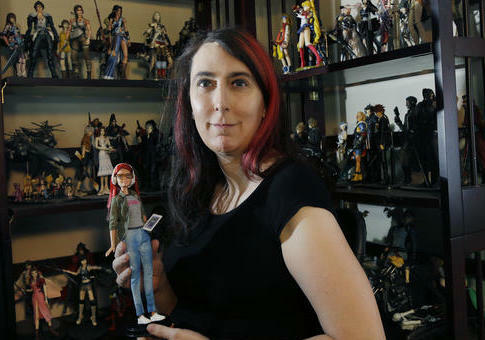 Video game developer Brianna Wu is running for Congress in Massachusetts' 8th District, challenging sitting Congressman Stephen F. Lynch in the Democratic primary. Most recently she was the subject of a positive New York Times Magazine profile, "Brianna Wu Wants to Change the Democrats’ Playbook." Wu, a prominent figure in online social justice advocacy, also maintains an active Twitter profile. She tweeted Sunday night about an incident where a United flight crew would not allow two young women wearing leggings to board. Some of Wu's followers pointed out that she was missing the full story, as the young girls were family of a United employee flying for free. "The longstanding policy requires those who enjoy the perks of airline employment, which include free travel passes for family and guests, to present themselves in a way that represents the airline well," CNN reports. Among the critics was a Twitter user named Quincy Fleming. @Spacekatgal I despise dress codes in general because it has to do with what women and girls wear, but this is pass travel. Wu responded in now-deleted tweets, which were saved by Pro Publica's tweet archiving website Politiwoops. "What's so impressive is the loud confidence of your statement while you are in no position to understand this," she shot back. "The line for men explaining things to me on Twitter is over there… Thanks for stopping by!" But Quincy Fleming is in a position to understand sexism, and does not belong in the "line for men." Fleming reported soon afterwards that she had been blocked by Wu. Wu deleted another tweet shortly afterwards in which she also dismissed a critic's opinion because he was a man, although it appears he actually was a man in that instance. This entry was posted in Politics and tagged Brianna Wu. Bookmark the permalink.